Disney TH!NK Fast: The Ultimate Trivia Showdown/Disney Think Fast: The Ultimate Trivia Showdown or Disney's TH!NK Fast: The Ultimate Trivia Showdown/Disney's Think Fast: The Ultimate Trivia Showdown, Mostly referred to Disney Think Fast/Disney TH!NK Fast, Disney's Think Fast/Disney's TH!NK Fast or simply just TH!NK Fast/Think Fast is a Trivia game developed by Magenta Software and published by Disney Interactive Studios. 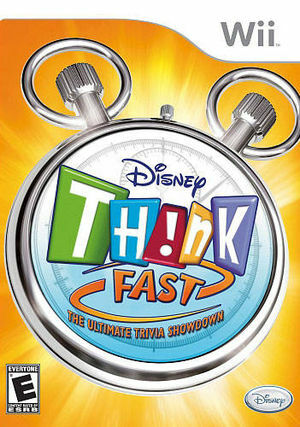 While the game does contain over 5,000 questions, most people criticized the questions for being too simple and repetitive, some which are not based on Pixar Movies (though the questions do change around a bit), which has caused mixed reviews. The graph below charts the compatibility with Disney Th!nk Fast: The Family Quiz Game since Dolphin's 2.0 release, listing revisions only where a compatibility change occurred. This page was last edited on 10 January 2018, at 17:43.